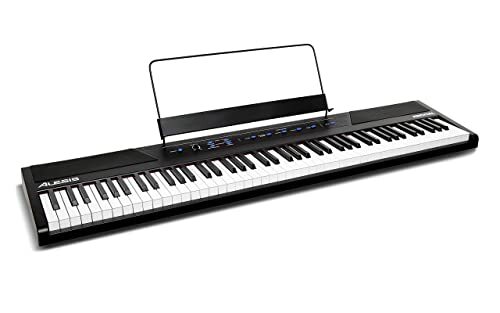 Best Cheap Keyboard Piano Of 2019 Reviews - Are Worth a Look? No one ever thinks of owning a piano as being affordable. This, however, does not need to be the case. While it is easy to spend a small fortune on a keyboard, affordable options do exist. And in fact, this is the topic that we will be looking at today. Good keyboards that do not cost an arm and a leg. We believe that whatever your price range, you deserve a dependable piano. That is exactly why we have scoured the market for the best options that are out there. 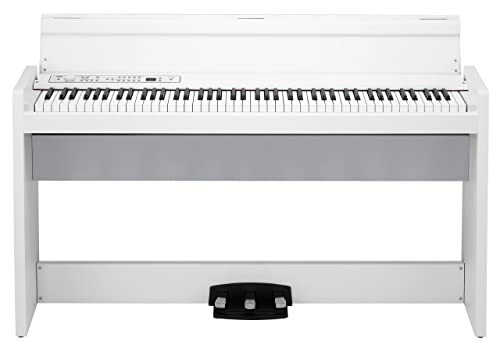 To start off, we have the Casio Privia PX-160 digital piano. The first thing that caught our eye here was the sheer strength of the bundle. When buying on a budget, you don’t always have the opportunity to get a furniture quality stand. The stand here is stylish and will suit most decors. It also features all of Casio’s signature touches. You get tri-sensor technology in their fully weighted and graded keyboard. This means that not only will the keys feel like the real thing; they will also play like an acoustic piano. The tri-sensor technology registers even the faintest of keystrokes. As a result, even the subtlest notes show up in your playing. You also get a high-quality sound engine and a built-in recorder. Regarding cons, there isn’t much to mention when the price is taken into consideration. There aren’t a lot of tones or sounds, but unfortunately, this is going to be a theme common to most of today’s options. One issue is durability. The furniture cabinet design is a little bit fragile. We found that it shows scratches and other cosmetic wear very easily. If you live in a calm household, this won’t be a big deal. After all, pianos shouldn’t be exposed to too much wear and tear, right? However, if you have pets or even children that enjoy rough play, you may have some problems. The stand itself is very attractive, but this does, of course, stop being the case when it’s been roughed up a little. This aside, it is a good piano at a very good price. Let’s now look at the Korg Lp380BK. This piano tips the scales in terms of expense for our list today, coming in at the highest price in the review. 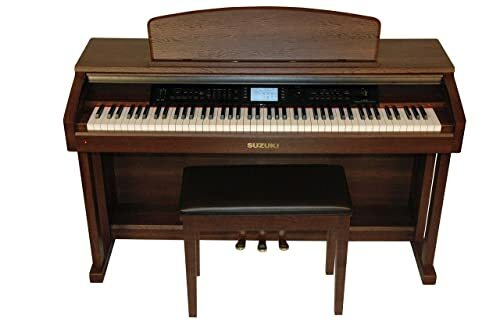 Though it still fits our definition of a cheap piano it may not be what you are looking for if you are on a restrictive budget. On the other hand, if you do have a little more money to spend there is plenty to like about it. The furniture quality stand comes with three pedals to maximize your playing options. You also get a fully realistic keyboard with weighted and graded keys and a range of sounds to choose from. The Korg also includes thirty built-in sounds for a variety of different tonal options. The truth of the matter is that there is little to complain about. The restrictive price may be a problem for some buyers, but the fact remains that this is a budget piano. It is worth mentioning, however, that the sound quality does leave a little to be desired. It certainly isn’t terrible but isn’t going to sound exactly like an acoustic piano in the way that high-end keyboards get close to achieving. Priciest piano on the list. In the Suzuki, we have a keyboard that looks remarkably like an upright piano. The classically rugged furniture stand will look good in any home. And of course, there is more. For as rustic as it looks, it’s actually very modern in terms of tech. The manufacturer goes so far as to call it a computer with keys. While that may be something of a leap, it certainly is an instrument with an emphasis on tech. This piano is Bluetooth, which allows for wireless recording. You can even sync it up to your iPad for a broader range of sound applications. Lastly, it features a weighted, graded keyboard that is designed to feel like a grand piano. There are, of course, a couple of issues. For one thing, we found that the features are a little challenging to figure out. Over time this will hopefully resolve itself, but until then it will be frustrating. 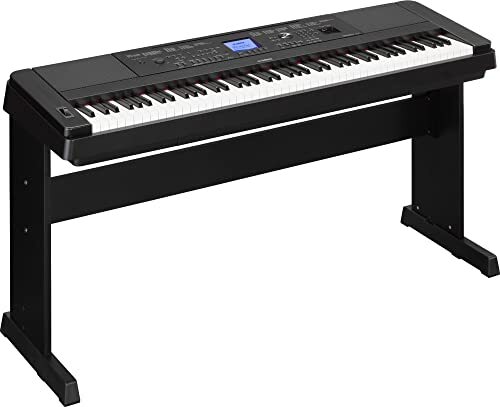 It’s also worth mentioning that this is one of the pricier pianos we are reviewing. Of course, like all of the keyboards on today’s list, it is affordable relative to the market. Still, if you are hoping to stay with the lower end of the price spectrum, you may want to keep looking. These things aside, it’s a great piano for users of every skill level. Let’s now look at the Yamaha DGX-660. Most shoppers will probably be familiar with Yamaha. They are one of the biggest manufacturers of pianos and have an excellent reputation. Suffice it to say; the DGX-660 falls comfortably into that category. It benefits from the same high-quality sound engineering that is a significant part of any high-quality Yamaha piano. The idea behind the sound engine is to replicate the noise of one of their most famous and most expensive grand pianos. You also get a six-track recorder that will allow you to record what you play. 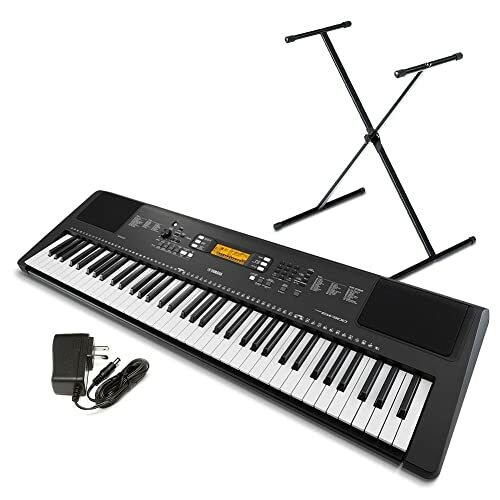 Last, but not least, the DGX-660 features fully weighted and graded keys. This means that you will enjoy a keyboard performance that feels like an acoustic piano. We did, however, notice one issue that may be aggravating to perfectionists. We found that the keys are reasonably noisy, producing squeaky sounds when you play. For regular playing, you probably won’t notice it most of the time. However, for quieter pieces that require nuanced playing, it will be noticed. This is a problem fairly common to electric pianos. However, for the price, many buyers may expect more from the DGX-660. Fully Weighted and Graded Keys. Let’s now take a look at a piano with a more moderate price tag. The Casio PX350 gives high-end features at a mid-range price tag. One of the best components of this piano is the keyboard. Pretty much every good electric piano comes with weighted keys. It’s a standard feature that helps make electric pianos feel a little bit more realistic. You get weighted keys here, and they are even graded so that each will feel slightly different. Casio takes things a step further with their tri-sensor technology. This feature is common to most of their keyboards, but it makes a huge difference in terms of performance. The tri-sensor feature ensures that even lightly played notes will register the same way that they would on an acoustic. Thanks to 128-note polyphony, you’ll get some vibrant sounds. Last but not least, you get 250 built-in tones, for a wide range of sound options. Concerning its cons, there was only one significant issue that is worth mentioning. We found that when playing at high-volume, the sound quality would become somewhat distorted. If you are looking for the truest sound possible, you won’t get it here. That aside, it is a good piano at a very reasonable price. Last for the under $1000 category, we have the Kawai ES100. This keyboard is a little bit more on the basic side, but it is moderately priced, and performs well. If you are a traveling musician, you might find plenty to like. It’s lightweight, compact, and you won’t have much trouble at all moving it from place to place. You don’t need to be on the road to like this option though. It includes a range of features that will benefit both experienced and new musicians. All users will appreciate the rich sound produced by the 192-notes of polyphony. 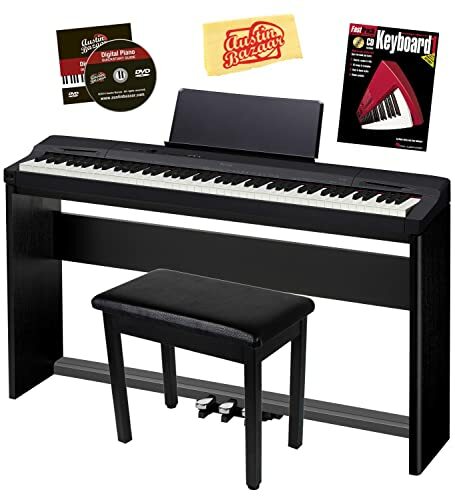 The piano also features a recording component, and even comes with free digital piano lessons for beginners. One of the most significant issues that we found was to do with value for money. Most of the features that you get here are nice. However, for the same money that you spend on this keyboard, you can get something that includes a far broader range of features. We also noticed that the weighted keys felt a little bit off. Piano keys, be they for an acoustic piano or digital unit, can vary in terms of weight. Even with that in mind, we found that the keys were heavier than on most other keyboards available. These issues aside, the Kawai ES100 is a good keyboard that most would be happy to own. Lacks value relative to other options on today’s list. Key weight is a little off. 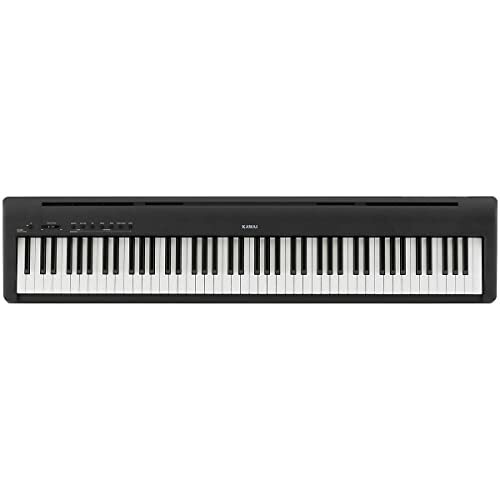 In the best digital piano under $500 category, we have the Yamaha P45. Despite the low price, you will see plenty of familiar features here. You get the same weighted and graded keys that were common to all of the other options that we have looked at today. This piano also features the same rich sound engine that you get with the other Yamaha keyboard that we looked at. This high-quality sound mechanism will replicate the performance of a grand piano. Last, but not least, it also features an easy to use interface that will suit beginners and experts alike. Of course, there are cons. The issues that we noticed are pretty much ones that people would expect to find in a keyboard of this price. The keys are noisy, and they don’t feel much like an acoustic piano. We also found that the onboard speakers were not very good. If you want to play at a high-volume, you may need to invest in some external speakers or use headphones. 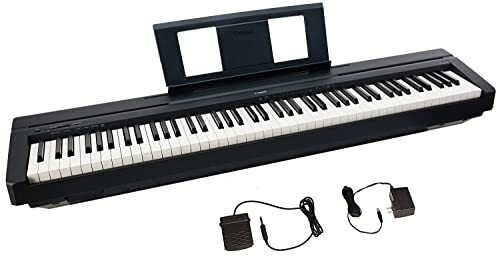 These things aside it is a good piano for a good price. Keys do not feel like an acoustic piano. In our second to last slot we have the Yamaha PSR-EW300. Though simpler than the other pianos we have seen today the price may justify the downgrade. If you are just starting out with the piano, you may appreciate the low-risk price point that we see here. Of course, it’s more than just affordable. One of the finest features that we found here is the keyboard. It is touch sensitive, which means that the harder you play, the louder it will sound. This sounds pretty standard, but for the price, this isn’t a feature that you will always see. You also get some pre-programmed songs to assist the beginner. The cons stem from its basic nature. There aren’t lots of features, and the sound quality is pretty weak. If you are looking for an acoustic piano quality sound, you won’t find it here. One of the most significant problems we found was built-into the design. You get 76-keys rather than the 88 that are standard to most pianos that we’ve looked at. If you are just starting out this may not be a huge deal. However, in general, it is beneficial to have a full keyboard. Last, let’s look at the Alesis Recital. This compact, affordable piano is going to be the perfect fit for the blossoming musician making their first foray into piano. It is a little basic, but you get what you need. Eighty-eight full sized semi-weighted keys will help you prepare for the setup of an acoustic piano. Fully weighted keys are always the preference but for the price what you get here is pretty good. You also get the ability to combine any two of the five sounds featured to create a richer playing experience. This is a feature that is often not seen in cheap keyboards, so this is nice to see. It even comes with three months of free digital piano lessons to help you get started. The biggest issues are what you expect from a piano for the price point. The sound quality sounds a little distorted and you also don’t get a lot of features. Still, for the money, you get everything you need to start out on the piano. Now that you have seen a list of the best cheap keyboards out there, it is time to make a decision. While we would not presume to select your instrument for you, we do, however, have a recommendation to make. All of the options that we have looked at today are good in their own ways. But, we simply found that the Casio Privia PX-160 Digital Piano provides the best deal. You get lots for your money. High-quality performance, and an eye-catching design not always found on budget buys. Of course, this is just our opinion. Now that you have read this guide you are free to make your own informed buying decision.